In Prefix you may notice that it does not profile all methods in your code. By default, the Stackify .NET APM Profiler only instruments key, pre-defined events in the IIS pipeline and page lifecycle. Custom profiling only works with Prefix Premium currently. One of the key benefits of the profiler, however, is that you may instrument how long any .NET method takes to execute and include that output in the call stack. In deciding what to profile, keep in mind the overhead that could be incurred. Please ensure to follow proper JSON document formatting. Incorrect formatting will prevent the profiler from starting. In order to get around the "Unknown Application Code" message in Prefix, you'll need to add some custom configuration to tell Prefix to profile certain classes and methods that are not profiled by default. With Prefix Premium, you can use the Custom Config Editor to define which classes and methods to be profiled in your code. All you will need to do is select your app, the assemblies, classes, and methods all within the editor and then save your selections. 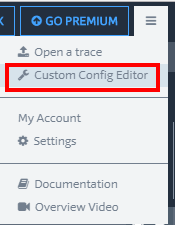 Once completed, you will now see your custom code in the trace details.